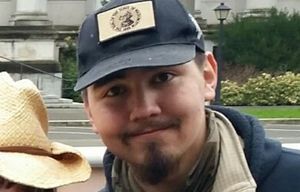 The youngest of the 25 people indicted after the takeover of the Oregon wildlife refuge lives on the Tulalip Reservation with his girlfriend and infant. They were planning to marry, then he would join the Army. But he was arrested instead. Their lives have gone haywire. TULALIP RESERVATION — It was about 10 in the morning when law-enforcement vehicles pulled up to the modest home where Eric Lee Flores, his girlfriend and their 6-month-old baby daughter were staying. There were three to five cars, at least one tribal police vehicle, and maybe three unmarked cars with FBI agents. It’s hard to keep an exact count when things heat up. Flores’ monthlong adventure into the world of self-described patriots had come to a discomfiting end on Feb. 11. The agents came because of federal grand-jury papers: Flores was one of seven men most recently indicted in the armed takeover of a national wildlife refuge in Oregon that had made headlines around the world with its images of cowboys and guns. Eric Lee Flores was indicted in the armed takeover of Malheur National Wildlife Refuge. Of the 25 people indicted in all, each faces up to six years in prison on charges of conspiracy to impede federal employees from performing their duties. It’s unclear all the charges they will face because the U.S. Attorney’s Office in Portland has stated that it plans to file a new indictment that could include additional charges. Of the bunch, Flores, at 22, is the youngest. Though the Oregon occupiers are receding in the headlines, the Justice Department’s subsequent prosecution is a complex, high-stakes case that is expected to come to trial in the months ahead. The lives of Flores and his girlfriend, Tiff Fryberg, 20, have gone haywire. By the time she had dressed that morning, Flores was in handcuffs and being led to a car. They were supposed to be married that weekend, she says. Now she just wonders what’s next. Flores was arraigned in Seattle and is being held at the Federal Detention Center in SeaTac. He is awaiting transfer to Portland to appear at U.S. District Court and make a plea. No, this is not how they had envisioned their future. Fryberg says her boyfriend had been talking to an Army recruiter and was ready to sign papers in a few days. You can learn a lot from scrolling through a person’s Facebook page. It’s obvious that Flores is captivated by things military, by things showing the U.S. flag, by slogans of patriotism. Here is a photo of Flores posted on July 7, 2014. He’s holding four rifles, two that Seattle police gun experts believe are AK-47 Kalashnikov sniper rifle variants, an AK-15 variant and a World War I-era model. But in between the postings about “(expletive) ISIS,” there were postings about the Seahawks, kissing Tiff, and posing happily with Eleanor, the baby daughter. This is the Eric Flores that Fryberg says she knows. Flores decided in early January to go down to the Malheur National Wildlife Refuge. The 41-day occupation by self-described patriots, many of them armed, began as a protest of the sentencing of a pair of Oregon ranchers, a father and son, for burning federal lands. “He was going to do a peaceful standoff. Standing up for the rights of farmers,” says Fryberg. Flores is neither a farmer nor a rancher. Perhaps he was captured by the sloganeering of the “three percenters” that he would post. That’s the self-styled patriot movement that claims that during the American Revolution, the active forces in the field never amounted to more than 3 percent of the colonists. In early January, Flores got rides and traveled several times back and forth between Oregon and Tulalip. Among those in his group was Darryl William Thorn, 32, a Bremerton worker. He also now faces the same federal criminal indictment, and has pleaded not guilty. He’s still in custody. There is a website asking for donations to help Thorn’s legal fees. As of Friday, $260 had been pledged, from eight supporters. Christina Wright, 28, an accountant, is Thorn’s girlfriend of two months. She traveled to Oregon with him and stayed at the refuge. She says that Flores and Thorn had been friends from their involvement in the “three percent” movement. She doesn’t understand why Thorn was arrested. The FBI says one way it tracked what the protesters were doing, and who they were, was their postings on social media. Flores returned home from Oregon in the days following the Jan. 26 confrontation that led to the shooting death of Robert “LaVoy” Finicum. By then, says Fryberg, she was having upsetting dreams. Fryberg says that both she and Flores are members of the Tulalip Tribes. Every member gets $1,000 a month, says a spokeswoman for the enrollment office. Fryberg says her boyfriend wasn’t working recently, figuring he’d be going into the Army. She says that in the past he had worked for the tribe at its swap meet. She also says the two met at Marysville-Pilchuck High School at an after-school multimedia group. She was a freshman; he was a junior. “I felt I could trust him. He was the only guy I could talk to,” she says. They began dating after Fryberg graduated in 2014. For a time, the couple and the baby stayed with Eric’s mom, Jeanifer Flores, of Marysville, who had remarried years ago. The young couple then moved to the home of an uncle of Tiffany’s, and that is where Eric Lee Flores was when the FBI arrived. Mel Sheldon, chairman of the Tulalip Tribes, says the tribe was surprised to hear of Flores’ indictment, and surprised at a tribal guy’s involvement with the militants. The Burns Paiute Tribe in Oregon had denounced the occupation of the Malheur National Wildlife Headquarters, which is its ancestral sacred land. “None of us knows how he came up with his belief systems,” says Sheldon about Flores. Fryberg says she had never considered how it all would end up in that Oregon standoff. “I was thinking it’d be over in a couple of weeks,” she says.